Switzerland threatened yesterday (4 December) to impose unilateral curbs on immigration should it fail to agree with the European Union on limiting the influx into a country where nearly a quarter of the population is foreign. After months of tough negotiations, Berne and Brussels are still gridlocked over how to implement a 2014 Swiss referendum for immigration quotas that would violate a bilateral pact guaranteeing freedom of movement for EU workers. The bid to seal an agreement has been stalled by EU member Britain’s similar demand to limit immigration from within the EU, making it hard for the EU to offer a preferential deal for Switzerland before it has settled matters with Britain. With just over a year left before the quotas must come into effect, Swiss leaders have now taken the most dramatic move yet in the negotiations. “If there is really no solution … we would be ready for a suspension of a part or all of the bilateral agreements,” Foreign Minister Didier Burkhalter told a news conference. The government has asked its justice department to draft unilateral curbs on immigration by March 2016 in the event there is no breakthrough. Swiss President Simonetta Sommaruga said this was not the preferred path and the country would continue EU talks in the hope of finding an agreement. A European Commission spokeswoman said discussions were “difficult” but continuing and Commission President Jean-Claude Juncker would meet Sommaruga again before the end of 2015. 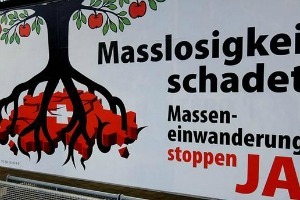 The February 2014 referendum, spearheaded by the anti-immigration Swiss People’s Party (SVP), has jeopardised a host of other Swiss-EU treaties that govern bilateral economic ties with the country’s largest trading partner and stand or fall together. A study commissioned by the government found exiting key bilateral pacts could cut output by up to 630 billion Swiss francs (580 billion euro) by 2035, or as much as 7% of GDP. Around 1.3 million EU citizens already live in the wealthy Alpine confederation and 300,000 cross the border daily to work. In 2014 nearly 111,000 nationals from the EU plus Iceland, Norway and Liechtenstein immigrated to Switzerland. If Switzerland does act unilaterally by introducing immigration quotas, the EU could decide to scrap the bilateral accords to send a message to other countries, the chief economist for Switzerland at Swiss bank UBS said. At least Brussels has stopped with the lie of solidarity, the fact is their position is one of ‘Do as we say or else !’. Yes, national sovereignty appears to be greater than solidarity. In the US we fought a civil war over states rights which contrasts with the EU’s attempts to bridle the differing cultures of individual states and mold them all into one country. Weather anyone realizes the facts or not, the EU leadership is attempting to form a United States of Europe. I wish you luck in your attempts to throw off the EU yoke. Why has the United states of Americans more solidarity ? It’s clear their results are the bests ones ! Economically financially unemployment rates ! States have learned that nationalistic doesn’t lead into nothing besides war ! Nothing against of California to be a national Country …Perhaps Obama should End the federal administration by giving all the three branches to States back ..would be an idea…not? Nothing against a REAL United states of Europe ! Others don’t want then they should make like Burrows said : Throw out the E.U. Joke ! Lets’s throw out the idea of Winston Churchill – Robert Schumann – Spinneli Group – Lets’ begin a pre-relict of the WW2 and a post WW3 Let’s begin the REAL SUFFER already forgotten in the graves of the past times ! Watch this coming presidential election closely, there is a humongous change in the air and it has everything you speak of but not in the context you expect. A new day is near and the business as usual model is doomed. The only reason the EU was invented was to stop warmongering Europeans from inflicting their bloody wars on the world. If you must include Churchill in your abstract reasoning at least a bit of research. – Mr Winston Churchill speaking in Zurich I9th September 1946. ‘friends and sponsors of’ does not mean ‘be part of’. Take a step back !? Are you against Sir Winston Churchill now ?!? He means clearly not a nationalistic self fully egoistic non-sharing Europe !!!!! The interesting question is going to be whether the EU will endanger trade with Switzerland over this issue. From an EU industrialists point of view it could be that they would rather protect the trade and forget the wishes of hundreds of thousands of people who want to travel over the frontier. (The Swiss industrialists of course have no say as the referendum negated their wishes.) Personally I wish the Swiss all the very best, the people have given their ruling and it is refreshing to find a government that seems to feel it is bound by that judgement, a rare thing indeed. Who would have thought: “A government governing by the will of the people.” Rare indeed in this age of corporate greed running amok in the ranks of the political elites. We need an harsh example and Switzerland could be a scapegoat to show the results in egocentric behavior. Let them bleed, let them bleed hard, so the popular referenda voters will crawl on their knees. The 7% or 580 billion euro is a very conservative estimate and when the truth will hit the mountaineers (they are the no voters, not the urbanized developed people) we will negotiate a treaty new style. No more concessions from the EU but hard demands and take it or leave it. Your comments put the type of EU you wish to see in sharp focus. “We need a harsh example”, “let them bleed hard”, “No more concessions”, “take it or leave it”. I am struggling to think of a way of describing the EU you clearly want which is not some form of oppressive, anti-democratic nightmare. You seem to believe that such threats / action will clearly cause the Swiss to collapse and give you everything you want. I suggest you look at Swiss history to see how they react to the sort of pressure you are talking about. Agree If Swiss end negotiations they will bleed for sure !!! Therefore Scotland or any other Country in the british Union should decide for themselves instead being dictated undemocratically by Westminster !! I would rather say let’s those all going out bleed very hard in FULL isolation ! Either IN or OUT with no cherish pick exceptions ! Why would an ultra-nationalistic people like the Scot’s join your EU when the only goal of the EU is to eradicate Nationalism ?, the clue is the party name ‘Scottish National Party’. Again I would refer you to the European Commissions own study which found the Scot’s, Welsh & Northern Irish hate your pointless EU just as much as the English. If you could stay in the realm of reality with your posts it would be helpful. Why ?!? A Reason to leave and an Easier way to get rid and separate that undemocratic british union ? Does Scotland as an fully independent hurt you ? Swiss don’t need the E.U. So the E.U. don’t need Swiss ! It’s logic an understandable !!! If you as a national country have negotiated bilaterally then you have to respect the agreements ! Why do you then negotiate ?? Sorry but I fully agree with Foreign Minister Didier Burkhalter !